The Leaving Certificate Applied is a two year Leaving Certificate available to students who wish to follow a practical programme with a strong vocational emphasis. With a certificate in Leaving Cert Applied students may do a Post Leaving Cert course and if they choose may take a longer route into Higher education. One of the biggest differences between the established Leaving Cert and the LCA is the system of continuous assessment. Students are assessed on the basis of project work completed over the two years and the final examination accounts for approximately one third of the overall marks. This Leaving Certificate qualification is particularly suited to pupils who are interested in going directly into the world of work after their Leaving Cert and the apprenticeship route. For more information on the Leaving Certificate Applied (L.C.A.) go to the Downloads section on this page and download our Parents Guide to our Leaving Cert Applied (L.C.A.) or contact our LCA Co-ordinator Sinead Ni Mhaoldomhnaigh. Each year The Michael Sweetman Educational Trust, award a visit to Strasbourg, France to 24 Leaving Certificate Applied students. While in Strasbourg the winning students visit the European Parliament, where they will have the opportunity to meet, work and socialise with students from other European States. It is a chance for students to spend a day in Strasbourg in the shoes of an MEP! 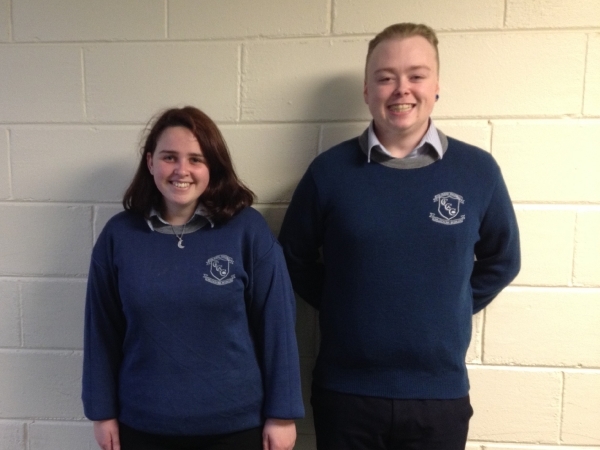 in 2018 two of our LCA 2 students, Pádraigh Mc Loughlin and Sarah Magnier-Whooley were awarded the opportunity to travel to the European Parliament. Both students were interviewed as part of the selection process. The interview was based on their Contemporary Issues topic they had chosen as part of Social Education. As part of this group Pádraigh and Sarah got the unique opportunity to experience EU decision making in the form of a multilingual European youth parliament. Euroscola allows these students to get together, debate, take sides, negotiate, amend, vote and finally adopt resolutions onreal European issues. Both students enjoyed this unique experience. A special thank you to their teachers Ms P.O’Connor and Ms. M. Lucey for their work in preparing and guiding Pádraigh and Sarah. Well done Sarah and Pádraigh - We are very proud of you both.